Mount Notre Dame High School has been around a long time, it was built in 1860, and originally as a boarding school for girls. Eventually it became a school, at one point it was for grades K- 12, and was also co-ed before becoming the all girl High School it is today. Obviously the building itself has changed over the years as well, between add ons, renovations, etc. The reason the school is making an appearance here on Creepy Cincinnati is because, like most of these old buildings, it allegedly has a ghost roaming the halls. Sometime in the 40’s, a young girl is said to have committed suicide there on the 3rd floor, and it’s this floor that she is now said to haunt. While she doesn’t seem to cause any problems, reports say she will open all the lockers on the 3rd floor at night, or sometimes turn the lights back on after everyone has left. Supposedly these things still occur regularly. My biggest problem with this story is that I don’t know ANYONE who would want to spend eternity at school. I mean come on…may as well go to hell, you would probably be happier. Then there’s the fact that the current building wasn’t even built until 1965, and not even in the same spot as the original. Little things, like facts, have a way of messing up a good story. 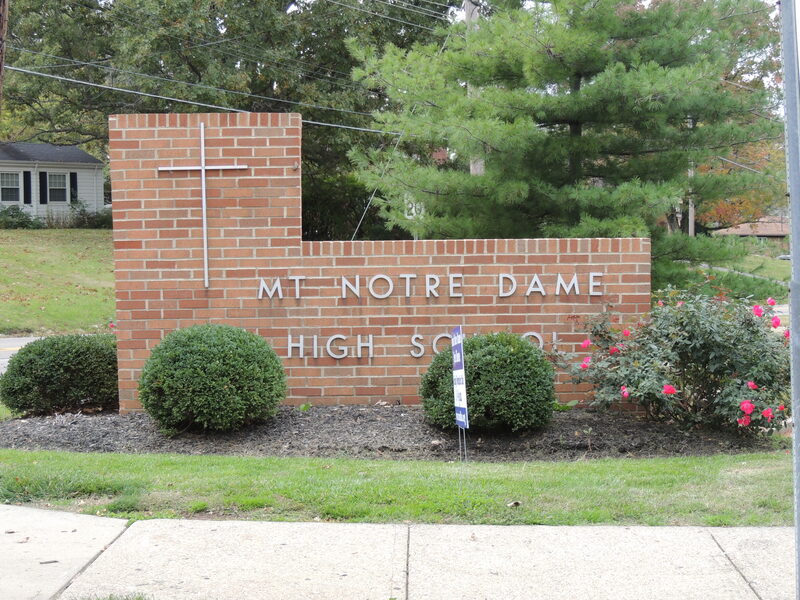 Mount Notre Dame is located at 711 East Columbia Avenue in Reading, Ohio. Can you visit this location? This is a private High School. You could always call and ask, but it’s doubtful you would get permission to visit. That is a photo of the newer school not the haunted school. This school was built in 1965. First class graduated in 1966. I was one of them. Interesting. I went to North College Hill, back before it was rebuilt. The PAC there was haunted. I was in band, and every year our director, before our first concert, would tell the same story about the ghost. You know, to scare the freshmen. I think it was my junior year he stood on the wing of the stage and told the story of the ghost, and a giant pipe fell out of the rafters, smashing through all kinds of stuff before landing directly behind him. He didn’t flinch, he just said, “See?” Had that pipe hit him in the head, it probably would have killed him. On its way down it hit a few lights and caused over $10,000 in damage. Ghost? Coincidence? I don’t know, but that’s one hell of a coincidence, if that’s what it was. I also performed in several plays on that stage, and when there would be nobody there other than a few of us on stage, we’d hear a toilet in the girls bathroom backstage flush. Of course, nobody would be in there. It’s not a newer or rebuilt school, they did an addition a few years ago to the front of the school. The “old” building is still part of the school and still used. Creepy things did happen there. I understand her staying at The Mount for eternity. It’s a wonderful place full of graces and blessings/empowerment. I like to visit this School on Friday Night, Let’s see what i would got. i like to visit because i’m interest in ghost stories and i went to many Haunted houses and places but i got nothing and let me see what i would got at that School. !!!! !